Phryganic plants are herbs or subshrubs with erect shoots that grow at low altitudes under hot and arid environmental conditions. Many phryganic plants are aromatic/medicinal plants and display the phenomenon of seasonal dimorphism (Thymus sibthorpii, Satureja thymbra, Cistus incanus, Phlomis fruticosa, Teucrium polium, etc.). Phryganic plants of the Mediterranean region are reported so far to be affected by summer drought stress. However, in the present study, the phryganic plant Origanum dictamnus appears to be affected by winter cold stress rather than by summer drought stress in the specific area. This triggered the investigation of the functional and structural traits associated with adaptation of O. dictamnus to cold stress. Winter plants of O. dictamnus in order to stand up to the cold, shed all of their large leaves and keep only the small apical leaves, which are covered with a thick insulating layer of dendroid non-glandular hairs. Epidermal and mesophyll cells of apical leaves contain antioxidant vacuolar phenolics protecting from oxidative stress due to low temperatures. Protection from oxidative stress is also provided by the antioxidant essential oils secreted by the numerous glandular hairs. Concentrations of stress indicators like proline and soluble sugars, are always higher in winter leaves compared to summer leaves. Principal components of the O. dictamnus essential oil are p-Cymene, Carvacrol, γ-Terpinene, and Borneol. The major constituent of the winter oil is p-Cymene (59.2%) and that of the summer oil Carvacrol (42.4%). The presented results provide a structural and functional elucidation for the largely deviating appearance of winter and summer plants of O. dictamnus, and favour the interpretation of adaptation of the plant to cold stress. Origanum dictamnus is a herbaceous perennial subshrub that bears round to oval leaves arranged in a decussate phyllotaxy and pink to purple flowers arranged in a spike inflorescence. As a medicinal plant, it exhibits various biological activities, such as antibacterial , antifungal , antioxidant  and insecticidal , and it also has therapeutical uses against sore throat, cough, and gastric ulcer . Origanum dictamnus is a seasonally dimorphic plant undergoing pronounced changes in winter and summer. Winter low temperatures activate a number of genes stimulating biosynthesis of reactive oxygen species (ROS), which cause damage to the cells (oxidation of proteins and lipids) . Cells react by producing antioxidant enzymes and non-enzymatic antioxidants, particularly phenolic compounds . Winter cold stress results in morphological alterations, such as reduction of the total plant biomass, decrease of the leaf surface area, curling of the leaves, covering of the leaves with a dense layer of hairs, shedding of the leaves, etc. Seasonal dimorphism has been anatomically and physiologically studied so far in a few plants only, primarily in Euphorbia, Phlomis, Cistus, Ballota, and Sarcopoterium [8–13]. These studies have been principally focused on summer drought stress, and information provided on winter cold stress is largely inadequate. The fact that a Mediterranean phryganic species (O. dictamnus) does not suffer summer drought stress, as many other phryganic species, but winter cold stress, gave rise to the present investigation on the structural and functional traits associated with this kind of stress. This is a first report on seasonal dimorphism and adaptation to cold of O. dictamnus. Comparative observations on seasonal dimorphism (winter-summer) of O. dictamnus showed that winter plants consist of many erect shoots devoiding of leaves, except for their apical region in which clusters of 5–8 small leaves exist (Figure 1A). These leaves have an average surface area on each side of 93.7 ± 6.7 mm2 and also a whitish appearance owing to their covering with a dense indumentum of dendroid non-glandular hairs. By the end of winter, the apical leaves dry and fall, and the same happens later to the shoot axes. At the beginning of spring, buds at the base of the plant break dormancy and generate many shoots, which during spring and summer progressively increase in length to 18.1 ± 2.3 cm. Summer shoots bear large leaves with an average surface area on each side of 408.6 ± 49.2 mm2, i.e. summer leaves are about 4.5 times larger compared to winter leaves (Figure 1A and B). By the end of June, at the apex of each shoot an inflorescence (spike) is initiated; it becomes fully-developed by the end of July. When winter enters, inflorescences become dry and drop along with the large lower leaves of the shoots. The only leaves to remain on the shoots are the apical small leaves with which the plant spends the winter period. Origanum dictamnus. Winter plant (A) and summer plant (B) in the field. Compare the density and size of shoots and leaves. Scanning Electron Microscopy (SEM) revealed that O. dictamnus leaves bear on both surfaces glandular and non-glandular hairs (Figure 2). Glandular hairs comprise peltate and capitate hairs, while non-glandular hairs dendroid hairs. The latter occur in higher numbers on winter leaves and on the lower leaf side (Figure 2C and D). Stomata have a higher density on winter leaves compared to summer leaves (Table 1). They are of the diacytic type and project over the epidermal level (Figure 3B). Origanum dictamnus. 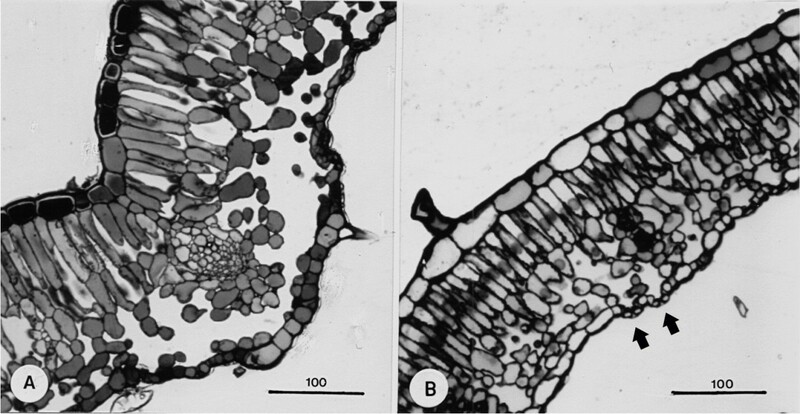 Stems of dendroid non-glandular hairs on the upper side of winter leaf (A) and summer leaf (B). In winter leaf, stems are denser and thicker. Networks of thin branches of dendroid non-glandular hairs on the lower side of winter leaf (C) and summer leaf (D). In winter leaf, network is much denser. Bars in μm. Means between columns with different letters are significantly different at p < 0.05. *Stomata on the upper leaf side are extremely limited. Origanum dictamnus. Cross-sections of winter leaf (A) and summer leaf (B). Winter leaf is thicker and bears dark phenolics in the epidermal and mesophyll cells. Arrows point to elevated stomata. Bars in μm. Anatomical studies on O. dictamnus leaves disclosed that winter leaves are much thicker than summer leaves, a fact mainly due to the higher relative volume of the spongy parenchyma (Figure 3 and Table 1). Vacuoles of epidermal and mesophyll cells of winter leaves are full of dark phenolics (Figure 3A), which under the electron microscope appear to have a fine-granular substructure (Figure 4A). Vacuoles of summer leaf cells are devoid of phenolics (Figures 3B and 4B). Chloroplasts in winter leaves are inferior to those in summer leaves as concerns their number per mesophyll cell section, the relative volume of grana per chloroplast, and the relative volume of starch grains per chloroplast (Figure 4 and Table 2). Origanum dictamnus. Ultrastructure of mesophyll cells of winter leaf (A) and summer leaf (B). In winter leaf, chloroplasts (cp) bear grana (g) with a few thylakoids and occasionally individual starch grains (sg). Vacuoles (v) are filled with fine-granular phenolics. In summer leaf, chloroplasts contain many multi-thylakoid grana and numerous starch grains. Vacuoles are devoid of phenolics. Bars in μm. Measurements of gas exchange parameters revealed that photosynthesis, transpiration, stomatal conductance, and intercellular CO2 are remarkably higher in summer leaves compared to winter leaves (Figure 5). The same holds for concentration of chlorophyll a and b (Table 3). Measurements of stress indicators such as proline and soluble sugars, revealed higher concentration values in winter leaves than in summer leaves (Table 3). Origanum dictamnus . 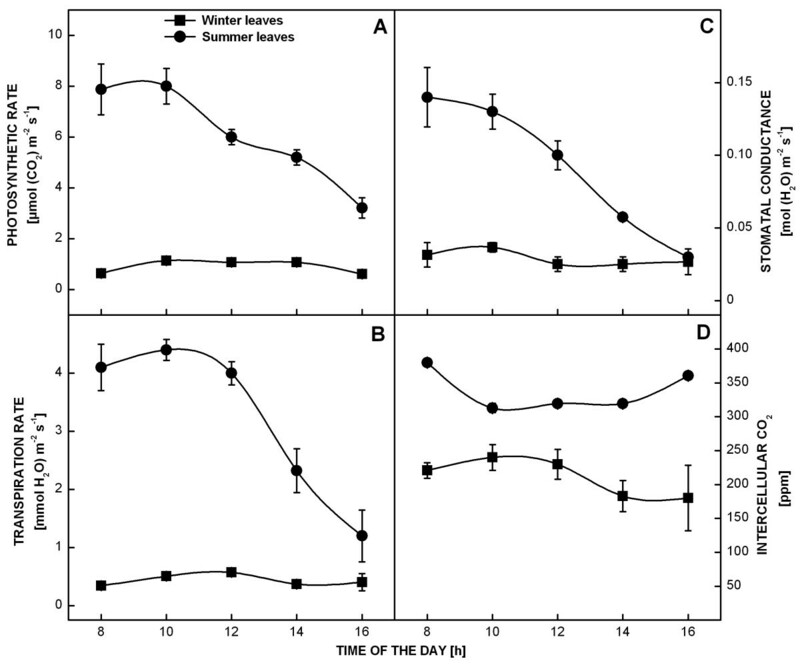 Gas exchange parameters measured in expanded winter and summer leaves. A: Photosynthetic rate. B: Transpiration rate. C: Stomatal conductance. D: Intercellular CO2. Quantitative analyses of leaf essential oils of O. dictamnus showed that summer leaves have a higher essential oil yield (2.78%, i.e. 2.78 ml per 100 g leaf D.W.) than winter leaves (1.05%) (Table 4). Qualitative analyses of winter and summer oils disclosed the presence of 55 compounds accounting for 98.8-99.8% of the total oils (Table 4). Both types of oils contain as principal components p-Cymene, γ-Terpinene, Borneol, and Carvacrol. The major constituent of winter oil is p-Cymene (59.2%), followed by Borneol (9.2%), Carvacrol (8.3%), and γ-Terpinene (0.9%). The major constituent of summer oil is Carvacrol (42.4%), followed by p-Cymene (18.5%), γ-Terpinene (16.6%), and Borneol (2.3%). aCompounds listed in order of elution from an HP-5 MS capillary column; bAI: Arithmetic indices as determined on a HP-5 MS capillary column using a homologous series of n-alkanes (C9-C25); cIdentification method: AI = Arithmetic index; MS = mass spectrum; Co-GC = coinjection with authentic compound. Concentrations below 0.05% are marked as Tr (traces); n.d.: not detected. Abscission from the shoots of all large leaves. With this strategy plants avoid exposure to low temperatures of a large foliage surface area, which might result in cell dehydration and plant necrosis. Maintenance at the apex of the shoots of some living leaves, a fact indicating that shoots are actually alive. These leaves undergo pronounced decrease of their size to avoid the unfavourable effects of cold (see above). Covering of the apical leaves with a thick layer of densely distributed dendroid non-glandular hairs. This thick layer constitutes an insulating shield which greatly reduces penetration of the cold into the leaf tissues. Development of a thick cuticular/waxy layer on the leaf epidermis (insulating layer, see above). Filling of the epidermal and mesophyll cell vacuoles with antioxidant phenolics that protect from oxidative stress due to low temperatures [7, 16]. Covering of the apical leaves with glandular hairs secreting antioxidant essential oils . Development of large intercellular spaces in the leaf mesophyll that contain air having higher temperature compared to that surrounding the leaf. The extensive leaf abscission during winter and the presence of dormant buds at the plant base of O. dictamnus favour the interpretation of a possible implication in winter cold stress of the phytohormone abscisic acid (ABA) . ABA is also involved in stomatal closure, which results in decline of photosynthesis, as it was observed in winter leaves of O. dictamnus . This decline is closely correlated to morphometrical assessments, such as the smaller number of chloroplasts per mesophyll cell section, the smaller relative volume of grana per chloroplast, and the lower content in chlorophyll a and b.
Measurements of concentrations of the stress indicators proline and soluble sugars on winter and summer leaves, revealed that their values were always significantly higher in winter leaves. The higher essential oil yield of summer leaves compared to winter leaves of O. dictamnus is correlated to the higher number of peltate glandular hairs occurring on summer leaves. Thus, peltate hairs (and specifically their head cells) are the only cells from all leaf tissues that possess the necessary enzymatic equipment for the biosynthesis of essential oil . The higher, therefore, the number of peltate hairs on leaves is, the higher the amount of the essential oil derived by distillation. The presented results (morphological, morphometrical, anatomical, ultrastructural, physiological, biochemical, and analytical) provide an elucidation for the largely deviating appearance of winter and summer plants of O. dictamnus, and favour the interpretation of adaptation of the plant to cold stress. Origanum dictamnus L. (Lamiaceae) was studied at the Aromatic Plant Institute, NAGREF, Thessaloniki, N. Greece (40° 54’ 03” N, 23° 00’ 18” E, altitude 16 m a.s.l.). At this region, the meteorological data in the three years of study (2009–2011) showed that during the winter months, the average daily air temperature was 7.9°C, the average daily relative air humidity was 77.4%, and the average daily rainfall 2.4 mm. During the summer months, the climatic conditions were mild (not hot and dry) with an average daily air temperature of 25.8°C, an average daily relative air humidity of 60.5%, and an average daily rainfall of 1.0 mm. Meteorological data were provided by the Meteorological Station of the Farm of the School of Agriculture, Aristotle University of Thessaloniki, Thessaloniki, Greece. Winter sampling was performed in January and summer sampling in June. Fully-developed leaves from the 3rd node (from the basis) of annual shoots were used. Leaf dimensions and surface area were measured separately for the winter and summer plants in each of the three years of study (a total of 36 measurements for winter and 36 for summer). Leaf surface area was measured with an MK2 leaf area meter (Delta-T Devices Ltd, Cambridge, UK) connected to a TC 7000 camera (Burle Industries Inc., Lancaster, PA, USA). A sample of 10 leaves was used for Light Microscopy (LM) and Transmission Electron Microscopy (TEM), and another sample of five leaves for Scanning Electron Microscopy (SEM). Leaf samples were separately collected from winter and summer plants each year. Pieces of leaves for LM and TEM were pre-fixed for 3 hrs with 5% glutaraldehyde in 0.05 M phosphate buffer (pH 7.2) and post-fixed for 4 hrs with 2% osmium tetroxide, similarly buffered. The temperature in all solutions was kept at 0°C to avoid leaching of phenols during fixation. Fixed samples were dehydrated in an ethanol series (50–100%) and finally embedded in Spurr’s resin. Semi-thin sections (1 μm thick) for LM were obtained with a Reichert Om U2 microtome (Reichert Optische Werke AG, Vienna, Austria), stained with Toluidine blue O and photographed on a Nikon Eclipse i80 microscope (Nikon Instruments, Amstelvee, The Netherlands). Ultra-thin sections (100 nm thick) for TEM were cut using a Reichert-Jung Ultracut E ultramicrotome, stained with uranyl acetate and lead citrate, and examined on a Jeol JEM 1011 transmission electron microscope (Jeol Ltd, Tokyo, Japan). 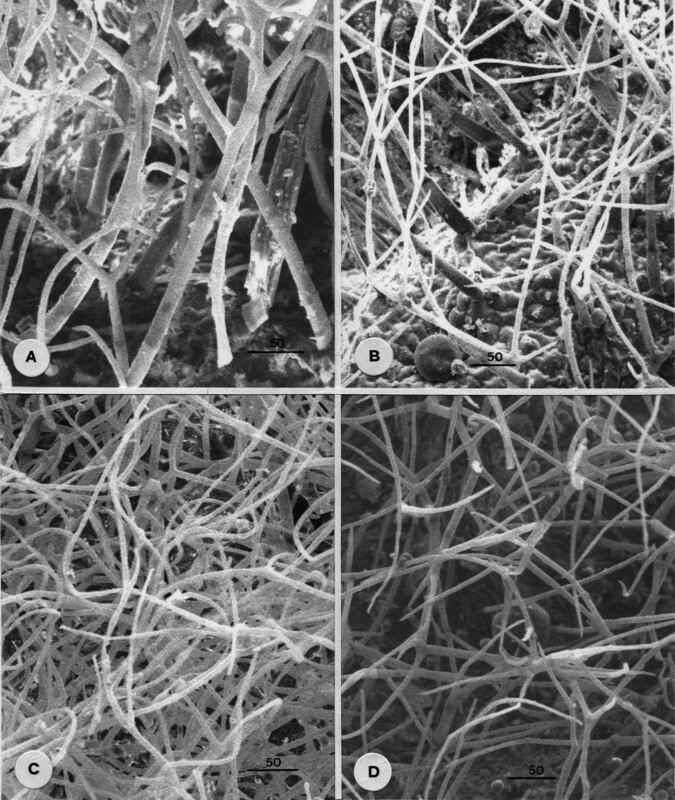 For SEM, the specimens, after fixation and dehydration, were critical-point dried in a Balzers CPD 030 device (Balzers Union AG, Liechtenstein) and then carbon-coated in a Jeol JEE-4X vacuum evaporator. Observations were made with a Jeol JSM 840-A scanning electron microscope. The relative volume of the leaf histological components was assessed by projecting a square lattice of point arrays, 10 mm apart, over 36 LM micrographs of leaf cross-sections (×500) . 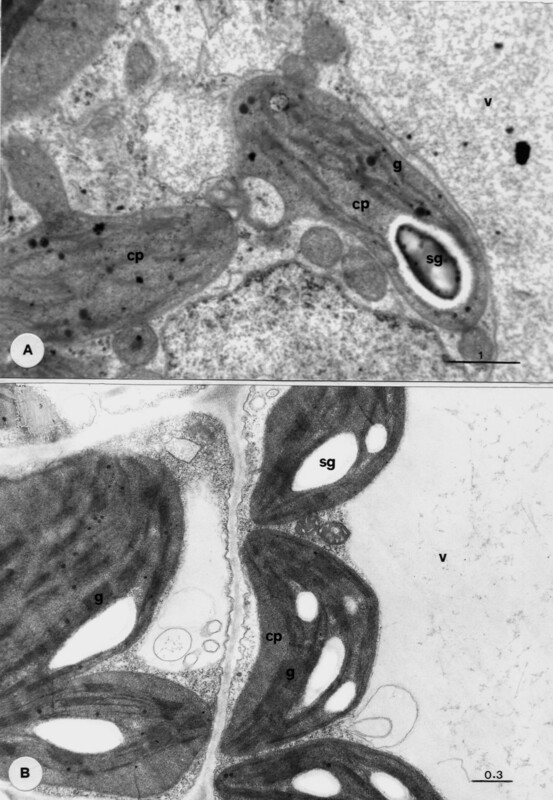 The same technique was applied to 36 TEM micrographs (×40000) to assess the volume fractions of grana, starch grains, and plastoglobuli per chloroplast. The density of stomata on both leaf surfaces was determined using 36 SEM micrographs (×160). Leaf gas exchange parameters (photosynthetic rate, transpiration rate, stomatal conductance, and intercellular CO2) were measured using a portable device (LC pro+, ADC BioScientific, UK). Fully-developed leaves of O. dictamnus were used. Three measurements in winter and another three in summer were conducted every year (2009–2011). For estimation of chlorophyll, proline, and soluble sugars, a total of 60 developed leaves (five leaves per plant × 12 plants) were used each year separately for winter and summer. Leaf chlorophyll content was determined after extraction of leaves (0.1 g) with 15 ml of 96% ethanol in a waterbath (78°C) for 30 min. For extract absorption (649 and 665 nm), an LKB Ultraspec II spectrophotometer was used (LKB Vertriebs GmbH, Vienna, Austria). Total chlorophyll concentration (chlorophyll a and b) was assessed using the equations of Wintermans & Mots . Pieces of leaves (0.1 g) were placed into a glass vial containing 10 ml of 80% (v/v) ethanol, and heated at 60°C for 30 min. The extract was then filtered and diluted with 80% (v/v) ethanol up to a volume of 20 ml. The leaf concentrations of free proline and soluble carbohydrates were determined in this extract following the acid ninhydrin method and the anthrone method, respectively . For proline, 2 ml of the alcoholic extract were transferred into a test tube and 2 ml of acid ninhydrin were added. The test tube was maintained at 95°C for 60 min in a waterbath and then allowed to cool at room temperature. Four ml of toluene were added and thoroughly mixed. After separation of the solution layers, the toluene layer was carefully removed, placed in a glass cuvette, and absorption was measured at 518 nm. For soluble carbohydrates, the ethanolic extract, as used for proline assay, was diluted 10 times with 80% (v/v) ethanol. The diluted extract was added drop-by-drop in 2 ml of anthrone reagent in a test tube (icebath) and left to mix the content. The fully-mixed sample was incubated in a waterbath at 90°C for 15 min and cooled. Absorbance was read at 625 nm. For proline and carbohydrate measurements, the LKB Ultraspec II spectrophotometer was used. Leaf material was air-dried at room temperature (24°C) and then grossly pulverized and subjected to hydrodistillation for 2 hrs using a modified Clevenger-type apparatus. The oil content was expressed in ml per 100 g leaf dry weight. Essential oil analyses were performed on a Shimadzu GC-2010-GCMS-QP2010 system operating at 70 eV. This was equipped with a split/splitless injector (230°C) and a fused silica HP-5MS capillary column (30 m × 0.25 mm i.d., film thickness 0.25 μm). The temperature program ranged from 50°C to 290°C, at a rate of 4°C min-1. Helium was used as a carrier gas at a flow rate of 1.0 ml min-1. Injection volume of each sample was 1 μl. Arithmetic indices for all compounds were determined using n-alkanes as standards . Relative percentage of separated compounds was calculated from total ion chromatogram by a computerized integrator. The identification of the components was based on comparison of their mass spectra with those of NIST21 and NIST107 , and by comparison of their arithmetic indices with literature data . Essential oils were often subjected to co-chromatography with authentic compounds (Fluka, Sigma). Analysis of variance (ANOVA) was performed using the SPSS software version 19.0 program for Windows (SPSS Inc, Chicago, USA). Significant differences between treatment’s means were evaluated using the Duncan’s multiple range test (p < 0.05). This work was supported by funds of the Aristotle University of Thessaloniki. The authors are thankful to A. Patakas for gas exchange and to Dr. D. Lazari for gas-chromatography facilities. VL performed the experiments. AMB designed the work and wrote the manuscript. Both authors read and approved the final manuscript.